Despite being exposed as a probable fake, the James Foley beheading video is still being used as a poster child to reinvigorate support behind a military attack on Syria, almost exactly a year after a dubious chemical weapons attack was exploited for the same purpose. 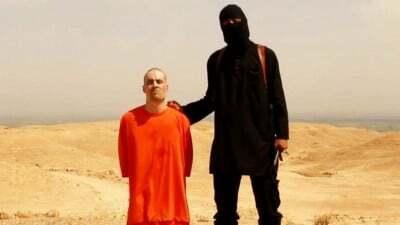 As we reported earlier, top forensic experts have concluded that the alleged beheading was likely “staged” and that the footage in the clip does not show the execution of Foley. Infowars’ analysis of the footage last week came to a similar conclusion. Although media reports have suggested that Foley was probably killed off camera, it makes little sense that ISIS, a group which has built its reputation on cruelty and barbarity, would refrain from showing the bloody execution. Indeed, the fact that they didn’t directly suggests that the video was produced and released by an entity other than ISIS. The fact that the footage was immediately pounced upon as a casus belli for expanding U.S. military operations in the face of massive public and political opposition to America’s involvement in the region indicates that the release of the video only served to benefit interests aligned with the U.S. military-industrial complex. Senior Republicans yesterday cited the video in urging President Obama to expand air strikes targeting ISIS militants from Iraq to Syria. Senator Lindsey Graham, a longtime proponent of an attack on Syria, said that Obama should not consult with President Bashar Al-Assad before launching the assault. Yesterday, the London Observer reported that the U.S. was “set to launch air strikes” on senior ISIS leaders in Syria, with Washington officials asserting that the Foley beheading video provided a “new context” which justified military aggression in Syria. Preparations for a military assault on Syria arrive roughly a year after another highly dubious incident was cited as a justification for similar action. The August 2013 chemical weapons attack in Ghouta was almost immediately blamed on the Assad regime despite eyewitness reports that the incident was the work of US-backed rebels. A subsequentMIT study concluded that the attack could not have been launched from government-controlled areas of the country.